This is the truth: I got the blues after we adopted Jellybean. Bad. I was crying frequently, unsure if we'd made the wrong choice by adopting him, and honestly grieving my old life with just me, Grace, and Willie. I had a constant knot in my stomach worrying how this little crying baby would ever fit into our household and whether we'd ever have peace and quiet again! Well, here's the reality 4 months later: I LOVE Bean and while my life and schedule has been altered since bringing him home, I also can't imagine things being any different now. And the other piece of that is that yes, puppies do learn. I feel like one minute we were in the thick of house training, worrying that our home would forever smell like urine, and the next minute I looked up and realized I can't even remember the last time Bean went to the bathroom in the house. Grace has been so patient and diligent in training him. We'd never trained basic commands before (because we always adopted older dogs who already knew them), and it turns out it's SO rewarding and astonishing how puppies learn. Having Jellybean has taught me so much about how things grow. It might sound cheesy or hyperbolic, but watching a puppy grow is pure magic. Seeing with my own eyes these past few months that puppies grow, flowers bloom, wounds heal, and winter turns to spring has been so life giving and special for me. I wrote once that Casper taught me that all things can be redeemed. I felt so privileged to get to witness his story, from abuse and neglect (and accompanying severe aggression) to the good life in his old age. He died more at peace than I think most humans can ever hope for. But in this new season of life raising Bean, I've learned about redemption all over again, in a different way. I've learned how a new being on this earth sees things and understands them for the first time, and how what seems like an annoying crying baby at first can turn your whole world upside down with love. The point of this post is to say this: you are not alone if you bring home a dog (or any pet) and wonder if you're regretting it! I just wanted to share my experience of post-adoption depression in the hopes that it might encourage someone who is going through it. I truly believe that for the vast majority of people, it is impossible to care for a living being and have it rely on you for sustenance and NOT fall in love with it. It's just a biological response. I'm sure there are exceptions, but give it enough time, and I really think that fears that you won't love a pet are unfounded in the end. How long? I'd honestly say it took Grace and me about a month to really love Bean. That's not to say we weren't sweet on him and didn't give him affection and take care of him during that time--of course we did. But to get to the point where I got so excited just to see him when I got home from work (in addition to Willie) and just wanted to scoop him up and kiss his snout all the time, it took a little while! I feel almost weird admitting that, but maybe it will help give someone hope who feels the same. After talking to a few people who have adopted dogs, I realize how common this feeling is. Grace certainly had it when she first got Casper; she bonded with him quickly but wondered if she was in over her head. And it was hard to immediately love Willie, too, especially while we were grieving Casper at the same time. But I kind of think a puppy has an especially steep loving-curve, if you will. They might destroy things in your house, pee on your nice rug, bark and cry in the night, eat things that give them diarrhea, and generally be a terror. It's easy to miss your old life when things were simpler, and you could sleep in past 6:30! (at least I did). But if you fake it til you make it, I really do believe that your attachment to the dog will catch up with the dog's learning and bonding with you as well. And the good news is that the more bonded you are with the dog, the easier training becomes, because the dog already WANTS to please you. The dog loving YOU isn't always automatic, either! But a dog's love and needs are so simple that a mutual attachment and fierce love is, in my opinion and experience, all but inevitable. A month of waiting for the bond to fully take root will undoubtedly feel like a lifetime, but the years of precious memories and good times as a family are so worth it. This past weekend I got two very exciting emails--our dogs' DNA results came in! A few weeks ago I DNA tested everyone in the house, as you can see from the kits in the photos above. Grace and I did the 23andMe human DNA ancestry kits, and I got the Wisdom Panel kits for the dogs. I'd originally planned to do a blog post about all of our DNA results once everything came back, but I'm too impatient to wait for ours! Full disclosure, we got the 23andMe kits as a free gift for attending an event; I probably would not have paid any money to find out that we're both European (which I'm sure is what our results will say). However, I would and did gladly spent too much money on finding out about the dogs' breeds, and the results were really interesting. I decided to just go ahead and post the dogs' results because it's going to be another month or so until our 23andMe results come in. I'll probably update on Insta stories but don't think it's worth a blog post for the scintillating and never before predicted information that Grace's and my ancestors migrated from the British Isles, ha! Okay so here's a little bit about my process of choosing the kit. There are TONS of dog DNA kits out there, and not all are created equal (apparently). I have no affiliation with Wisdom Panel but I'm going to describe why I chose to buy it and my experience in case anyone out there is trying to decide which test to get. I based my decision to buy the Wisdom Panel off reading consumer reports online and Amazon reviews. I have heard that with some DNA tests you have to send a picture of your dog or a description, which seems suspicious. We did not do that with Wisdom Panel; all they ask is for the cheek swab samples (which you mail back in a pre-paid box) and your dog's name and approximate age. So they have no way of determining the dog's breed based on a photo or description. Also, a big factor in choosing Wisdom Panel was reading about the consumer report tests where multiple samples from the same dog were sent in, using different names and contact information, and the results came back identical, down to every percentage. In other words, they're not just randomly assigning breeds; there has to be a method to the madness because samples from the same dog came back consistent (if that makes sense). Finally, I was further reassured that I'd chosen the best test when our veterinarian--who I trust with my dogs' lives--said that Wisdom Panel is the best test out there, and it's the one they recommend and use for their own pets. BUT: all of that being said, I'm a little skeptical of our dogs' results. I don't think that Wisdom Panel makes up any results or is bogus, but I think the level of technology and science they're using might be a little bit basic or less advanced than say, the 23andMe analysis for humans. Which is fair; they're dogs. Anyway, here's the actual part you're probably interested in: what kinds of dogs Willie and Jellybean are. These are all of the tests they do to determine if a dog is a "purebred." According to the website, they run each of these tests independently, and if even one is a "fail," they the dog is not purebred. Willie passed all of them. They also give you some info about sensitivity to medicines (thankfully, both of our dogs came back normal), and weight range. Willie is right in the middle at 61 pounds. So there you have it. I still think Willie is not a purebred dog of any kind, but on another note, the concept of "purebred" dogs is a weird one and not something I'm really interested in promoting. Dog breeds were invented by humans, mostly in the past 200 years. There are some "ancient" breeds (like Chihuahuas and some Mastiffs, for example), but beyond that, most dog breeds have become what they are today relatively recently. So therefore, the concept of a breed being "pure" is based on standards set by people not nature--and SO much research shows that purebred dogs can have a lot of health problems due to being inbred (not always, but it's important to be aware that purebreeds are not inherently better/healthier than mixed breeds--often the opposite is true). Just putting that out there. I'm often surprised how many misconceptions are out there about dog breeds. What's probably the most surprising about Jellbean's results? That there's 0% Dachshund. I think that's one of the most common breeds people guessed when looking at Jellybean, so it will probably be surprising that he is not a Dachshund at all! 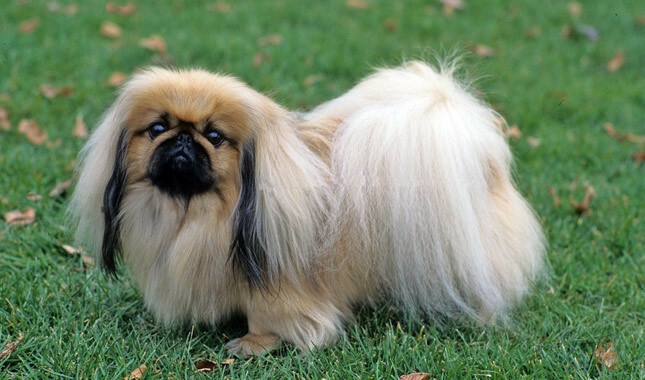 I think his long body comes from being part Pekingese, which is also a long dog. Also, I think Jellybean's weight profile is telling, because he's not yet a year old and he's already a bit over 11 pounds. To me, this suggests that the 25% generic "terrier" mix includes something larger, and helps explain why our vet thinks (based on his physical exam of Jellybean's legs, especially), that Jellybean has some type of pit bull mix in his ancestry. He's a unique guy. I kind of love that I've never really seen a dog that looked quite like either of our boys--there's no one else quite like them! That said, both of them must have siblings somewhere out there. It would be so cool to run into a twin of either of them some day. If you are considering a DNA test for your dog, I highly recommend it! It's very interesting and felt like Christmas morning to get the emails in my inbox. But no matter what the results would have been, of course it wouldn't change how I feel about the pups. It's just for fun! We are falling more in love with little Bean (I'll explain more about his full name below) every day. We're still getting to know his personality, so I'm going to save my "Meet Bean" post for later, but I wanted to go ahead and write a post about how we ended up with this little guy! It's kind of a funny story, and overall it's felt very meant-to-be. The process of integrating him into our family has been so much fun but not 100% smooth sailing--there have been moments where we worry about how he fits into our lives or Willie gets annoyed with having a puppy in the house. So with that in mind, you can expect posts about bringing a new puppy into the house with an existing dog, as well as thoughts on crate training, socialization, and more. I can't wait to share all we've learned. But without further introduction, here's the story of how Bean came to be part of the family! To set the stage, I should explain that we have been thinking about getting Willie a sibling for awhile--pretty much since we adopted him, actually! We knew that bringing two dogs on the Alaska trip would probably be too much, so we wanted to wait until we were back. But, as soon as we saw how much Willie LOVES other dogs , we thought it would be a great idea to get him a brother or sister. When we started the search, we were pretty sure what our next dog would be like: a girl, pit bull, and most likely already a few years old. Well, as I wrote in my post about bringing home Willie, we make plans and God laughs. We ended up with a dog that is different in every way: a boy, a tiny little mutt, and a PUPPY! Not what we were looking for at all. But somehow, that convinces me even more that he was meant to be ours. We'd been looking for a pit bull rescue and working with a few rescue organizations, mainly because we were worried about adopting from a shelter where we couldn't introduce Willie to the dog before adopting. With an existing dog, that's definitely an added complication. We contacted Angel City Pit Bulls and Bullies and Buddies (local rescue orgs) and even set up some meet and greets with adoptable dogs. But while we were mulling over what to do, we happened to run out of food for Willie. We went to our local pet store, Tailwaggers, for some food for him, and they happened to be having a cat adoption event at the time. Not being in the market for a new cat, I ignored the setup, and went straight for Willie's food in the back of the store. But then Grace pointed out that there was a little puppy right in the middle of all of the cat carriers! He was shaking like a leaf and seemed very confused and lonely. The lady from the rescue organization running the adoption said I could pick him up, so I gingerly lifted him into my arms . . . and he promptly stopped shaking and fell asleep. To say I was instantly smitten would be an understatement. He already matched Willie! I'm a sucker for "signs," so when I noticed that, it was kind of all over for me. The person running the rescue said they had to schedule a home visit, which they did for later that week. They drove him to our house, checked out the puppy supplies we'd bought, supervised the introduction to Willie, and then he was ours! We kept him from that night forward. That said, the sweet sleeping puppy at Tailwaggers was kind of a ruse. Haha! I can't blame him, because he IS just a puppy, but we had some house training to do, and we've also been teaching him to be comfortable and not cry in his crate (side note: I was totally not into crate training before getting this puppy, but now I see how necessary it is and have been converted!). He is rambunctious, fun, silly, and super playful. So far he is definitely a big dog in a small dog's body, which is exactly how we want him to be given that his older brother is huge. He's done great at puppy playtime and boarding over Christmas, and I think he shows every sign of being a very good dog. It's just a different experience from adopting Casper and Willie, who were both totally trained when we got them! We have to work on Bean, but it's a new experience that we're grateful to have. What's his name/how did you pick his name? What kind of dog is he? How big is he going to get? The answer to both is kind of a mystery! I've never had a small dog before, and from what I understand they stop growing more quickly than big dogs do. That said, Bean is only about 4-6 months old, so it does not sound like he is done growing yet. He gained about 1 pound in 4 weeks, so we're hoping he'll get a little bit bigger! He's 10 pounds right now, and I think his full-grown weight will be 15-20. As for what kind of dog he is, he's probably a combination of some or all of these breeds: mini dachshund, jack russell terrier, and chihuahua. As he grows, we'll probably be able to tell more, and I also plan to do a doggy DNA test for both him and Willie. I'm very curious, but ultimately it doesn't really matter--I firmly believe that breeds are just a guideline, and especially for a mutt, so much of it depends on training and the energy you (as the alpha) bring to the relationship. Is it difficult having a puppy? Honestly, yes, it's a lot more work than just with Willie! But Grace and I are "dog people" through and through. We love dogs of all shapes, sizes, ages, breeds, etc. And this is a new chapter in our life and new adventure--and we can't wait for MANY more years with little Bean! We love him and it's so much fun to share him on the blog. Thanks for reading! I have lots more to share soon. He's the cuddliest little guy!